BIG SALE!! SKULL & SKELETON STATUES BIG SALE!! Crazy about Zombies? 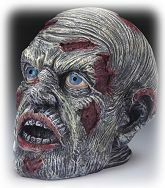 Get your own scary almost life size, hand painted 3D Zombie Head figurine for that authentic and horrific effect. Hand painted cold cast resin figurine in glossy gift box. Large winged dragon has creepy red eyed skull in her nest next to her eggs! 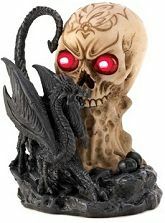 The huge red skull eyes light up with LED lights and randomly change colors to create an eerie feeling. The on-off switch is on the base. Use with 2 AA batteries for up to 24 hours of continuous use, the batteries are not included. Packed in a glossy white gift box. This skull box has Flashing eyes and plays creepy music. A great place to keep your secret keepsakes. Hand painted cold cast resin figurine packed in a glossy black & silver gift box. Premium quality Grim Reaper Skull stainless steel mug has colorful 3D embossed flaming grim reaper set against a gothic castle background, a decorative bone handle and metallic Celtic border. You'll have the best mug in the house! Exquisitely detailed mug in vibrant colors, packed in glossy picture gift box. 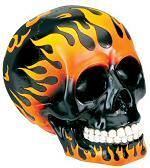 Finely hand painted Flaming Hot Rod Skull with vibrant orange and yellow hues against a glossy black background. Pay homage to your hot rod. Beautifully packed in a glossy black & silver gift box. 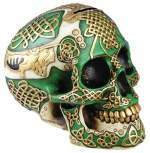 Premium quality Celtic Lion Skull savings bank. Finely hand painted in vibrant gold and green hues, the Celtic scroll work and lion is seemingly carved in relief out of the thick skull wall. Why not save your money in a work of art? This Lion Skull is perfect for young or old Detroit Lions fans as a bank for their wagers. Beautifully packed in a glossy black & silver gift box. 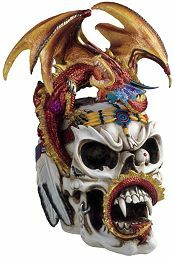 A large Ruby and Gold Dragon guards his precious Indian Vampire skull, which is adorned with a decorative beaded and feathered warrior head band. This hand painted and finished cold cast resin dragon comes in a gift box with heavy foam packing.